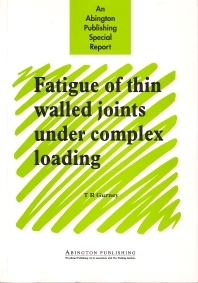 Management summary; Thinness effect: Constant amplitude fatigue tests on 6mm and 2mm thick specimens; Investigation of ‘hot-spot stress’ concept; Scatter; Variable amplitude fatigue tests on welded joints in rectangular hollow sections (RHS). A report containing the results of a TWI Group Sponsored Project which will be welcomed by designers of thin walled structures, especially those in the transport industry. It will also serve as a valuable source of reference for a wide range of welding engineers and structural analysts. Dr Tim Gurney worked at TWI (formerly the British Welding Research Association) for over thirty years, during which time his primary interest was in the fatigue of welded structures. He has written or co-authored over fifty papers throughout his career.